1,520 mm. This is exactly the official railroad track width used in the countries of the Commonwealth of Independent States, Baltic states, Mongolia and Finland. Its total track length is 226,830 km in the “area 1520” (world total being 227,678.4 km). 1,520 mm track is called wide gauge track. Wide gauge track is the second longest in the world. The so-called “Stephenson’s” (“European” or “standard”) track is the most widely spread track today: 1,435 mm or exactly 4 feet and 8.5 inches. Estimated total Stephenson track length is 720 thousand km. This track was first used by George Stephenson on his first railroad, and then extended to the major part of Europe, and, finally, became a standard in Europe and North America. The 1,067 mm or 3.5 feet wide so-called “Cape track” is insignificantly less popular than the “standard” one in terms of the number of countries that adopted it. About 112 thousand km of “Cape lines” cross dozens of countries on both sides of the equator (Japan, South Africa and Australia allowing for the major part of it). The fourth place in incidence in the world (95,000 km) belongs to the “1 m track” (1,000 mm). It is most popular in Brazil, India, South-East Asia and Afraica. Track width used to be adopted without sufficient justification or calculations during the initial railroad construction period in the XVII-XIX centuries. So, the first Decaville railroads were 500 mm wide in France, while British Grand Western Railway was 2,140 mm wide. There existed about 70 various railroad track widths in England alone. This great dispersion was due to leadership of every new railroad having their own ideas about the track. Narrow gauge track construction and operation were much cheaper. Narrow gauge railroads easily fitted into complicated relief and narrow city blocks. However, broad gauge had undoubted advantages as well: it was more reliable and possessed a much higher throughput. The lack of unified track on railroads within a single country naturally complicated line operation and slowed down cargo delivery and passenger traffic. Russia became the first country in the world in the XIX century to introduce a unified rail interval distance on its railroads. The 1,524 мм (5 feet) standard was first used in the construction of the double-track Petersburg-Moscow railroad. It was put into operation in 1851, and became an implementation of scientific and technical ideas in the sphere of railway transport and principles of transport policy with respect to railroad construction in Russia. Having studied European and American experience, Russian engineers had become the first in the world to develop a method for selecting basic technical railroad parameters, in particular track gauge, limit slope depending on local topography, cargo turnover, and locomotive capacity. 1,524 mm was no occasional choice of track gauge. It was broader than the American one, which meant higher stability, throughput, and speed as compared with the “Stephenson”: track. 1,524 mm is exactly 5 feet, which was convenient for calculations. 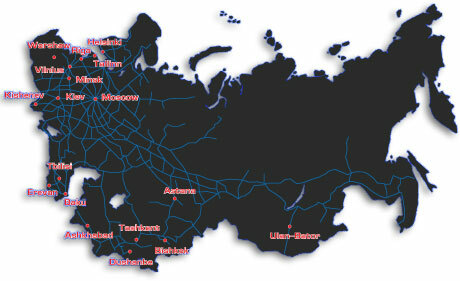 The construction of the Petersburg-Moscow railroad gave an impulse to the development of domestic machine engineering. Russia started manufacturing locomotives and cars for a track standard of 1,524 mm. Since 1851 on, wide gauge has become the unified size in the construction of all railroads in Tsarist Russia proper and all parts of the empire, and then Soviet Union. Track gauge was changed for 1,520 mm since late sixties in the ХХ century for convenience of calculations.